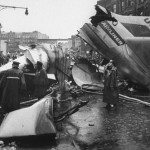 A United Airlines DC8 and a Trans World Airlines Super Constellation collided over New York and bodies and debris fell all over the downtown area. On the morning of December 16, 1960, two airliners were approaching New York City, a United Airlines DC8 jet and a Trans World Airlines Super Constellation propeller plane. Suddenly there was silence from both planes as the controllers at La Guardia and Idlewild, now John F. Kennedy, airports tried to establish contact. The two aircraft had collided a mile above the city and debris and bodies plunged to the ground. Many of the 134 passengers and crew who lost their lives on that snowy New York morning were students returning to the city for the holiday. On the ground, six people were killed by falling debris. The TWA flight fell to the ground from a mile above Staten Island while the United continued on a trajectory towards Brooklyn. It was, at that time, the worst air disaster in U.S. history. The TWA flight was heading for La Guardia Airport while the United Airlines plane was about to land at Idlewild, now known as John F. Kennedy Airport. As it approached the city, the United jet was told to take a holding pattern at 5,000 feet over Preston, New Jersey, until it could be cleared for Idlewild. The TWA plane was told to stay at 6,000 feet over Linden, New Jersey, until it was cleared for La Guardia. The planes would thus be several miles apart and separated by 1,000 feet of altitude. One of the air controllers at La Guardia suddenly called out to the TWA pilot that he had jet traffic nearby on his right. There was no response. At the same moment the United’s DC8 told Idlewild that it was at 5,000 feet. It was given landing instructions from the tower but there was no response. The DC8 crashed into a heavily populated district of Brooklyn, burying itself twenty feet into the ground and demolishing a church that stood there. The DC8’s tailplane continued along a street, crushing cars and ending up a hundred yards away. Gas spilled all around and several buildings and a car caught fire. One eleven-year-old boy, Stephen Baltz, crawled out of the plane, his clothing on fire. Two policemen pulled him away from the flaming wreckage and rolled him in the snow. After a few hours, despite being badly burned and having a broken leg, he was able to sit up and talk at the Brooklyn Methodist Hospital. He died two days later. Emergency teams from the army, navy, and air force arrived and fought the fires, trying to prevent them spreading. Shops in the vicinity became temporary mortuaries. Everyone became involved. The church that was demolished by the DC8 was a gray three-story structure known as the Pillar of Fire Church. The ninety-year-old caretaker, Wallace E. Lewis, who lived on the third floor, was killed. Ten residential buildings along with the church were set ablaze. Part of a wing was caught in the torn roof of an apartment building while a thirty-foot section of the tail was sprawled across a street intersection. Firemen waded through water carrying body after body to temporary morgues in garages. As dusk approached, the fire department switched on its emergency searchlights and firemen continued to search for bodies both from the plane’s wreckage and among buildings destroyed on the ground. They also collected as many personal items as they could to aid in identification of victims. The wet streets began to freeze and this added to the difficulties of the task. A further hindrance came with the hundreds of motorists, sightseers, and those homeward-bound from work stopping to witness the event. Red Cross and Salvation Army staff gave out hot soup, donuts, and coffee to the exhausted disaster workers. TWA’s fuselage landed in three pieces on Staten Island across New York Bay from Brooklyn. The pilot tried to land the plane on Miller Field nearby but it broke up and exploded before it reached the ground. Wreckage was scattered all over the airfield. Bodies were seen falling into the water. Rescue boats searched for survivors. They found six but all died before they reached a hospital. Rescue work went on through the day. By evening friends and relatives of those who had been on the planes arrived seeking answers, often slowing down the rescue work. The inevitable questions soon arose. How could a disaster like this happen? Explanations began to come out when the Federal Aviation Administration released transcripts of the conversations between control officers at the two airports. The captain of the DC8 was found to be at fault. At the time of the collision his plane was nine miles off course. Furthermore, he was flying at 346 mph instead of 207, the approved speed for a plane at 5,000 feet. Final death toll was 134 from the planes and 6 killed on the ground, for a total of 140. It was the worst air disaster up to that date and it happened on the fifty-seventh anniversary of the first flight in 1903. Added to eight other accidents involving scheduled airlines in the United States in that same year, it would make 1960 the worst year ever in terms of deaths from airline accidents. Fortunately, the destruction to people and places on the ground was much less that might have been feared but the message to authorities from the tragedy was clear: a metropolitan area like New York must do everything in its power to ensure that a disaster like this never happens again. While a tragedy like this one over a major city is an unusually disastrous one, the problem of air crashes involving human error remains as a continuing challenge. As the numbers of people traveling keep increasing there is a corresponding increase in accidents and in almost every one human error is found to be the cause of the accident. On July 17, 1996, TWA 800 left New York for Europe and as it gained altitude off Long Island it exploded and fell into the sea. There were no survivors. Later investigations showed that the cause of the accident was faulty wiring. On October 31, 1999, Egyptair 990 left New York for Egypt but soon afterward crashed into the ocean off Long Island. Following extensive studies of possible causes the only possibility left was that the co-pilot decided to destroy the plane and everyone in it. On July 25, 2000, Concorde AF 4590 took off from Paris en route to New York. Within a few minutes it crashed in flames. No one survived. The cause of the accident was a piece of metal that someone had left on the runway. The metal had slashed a tire on one of the plane’s landing wheels and then cut into a fuel tank. In 1960, the degree of sophistication in jet travel was at a very early stage. The many safety features of today had yet to be developed and installed and pilots needed exposure to various climatic conditions in order to learn how to cope with them. Thirty years later, by 1998, travel was still commonplace but jet airliners were fitted with numerous technical aids to make travel easier for both pilots and passengers. This was especially true for Swissair, an airline that frequently flew from New York to Switzerland and had an excellent safety record. Pilot error, however, just as it had been in 1960, or perhaps pilot inability to cope with unusual emergencies, were still very much a danger to be considered as was found in Swissair flight 111 in 1998. It left New York’s JFK Airport between eight and nine in the evening of September 2, 1998, en route to Geneva, Switzerland. On board were people from the United Nations, scientists, and tourists. The plane was into its flight for less than an hour and had almost reached its cruising altitude when smoke was detected in the cockpit. The route over the Atlantic lies along the coast of New England and eastern Canada and at the time of the smoke alarm Halifax in Nova Scotia, Canada, was the nearest airport. Arrangements to land there were quickly made. It was then that a number of extraordinary things happened. With fire developing rapidly to the point that pilot and co-pilot had to wear oxygen masks, the captain began to follow a list of more than two hundred procedures to try and locate the source of the fire. Swissair’s rules required him to do this. At the same time, convinced that the plane was too heavy to land, he circled the airport twice in order to dump fuel. All of this took time, far too much time as it turned out. Maybe the captain seriously underestimated the amount of time he had before the fire completely overwhelmed him. Maybe his training never prepared him for an event of this kind. The co-pilot urged him to land immediately but he refused. As it turned out, it took less than fifteen minutes for the fire to grow into an inferno. Meanwhile passengers had put on their lifejackets as they expected the plane might have to land on water. The list of more than two hundred procedures involved checking all the electrical circuits one at a time and the captain made every effort to do this. Experts later concluded that this activity might have accelerated the fire by creating a surge of electricity. In any case, both the checking of electrical circuits and dumping fuel took too much time. The fire cut off all power and at half past nine in the evening radio communication with Halifax was lost. A few minutes later Swissair 111 plummeted into the ocean forty miles east of Nova Scotia, off Peggy’s Cove, killing everyone aboard. This disaster, like so many others, had resulted from human failures whether deliberate or not. The wiring used in both TWA 800 in 1996 and Swissair 111 in 1998 was known to be faulty but had not yet been replaced. The Rescue Coordination Center in Halifax, Nova Scotia, had been alerted about a possible accident. Within minutes of the crash it sprang into action. Planes scoured the Swissair’s last known location and ships began the surface search aided by flares. For some time it was not known how the plane had come down so search and rescue was the order of the day. The largest hospital in the area, the Queen Elizabeth Two Health Sciences Center, cleared its emergency rooms and prepared for a flood of casualties. Ambulances and fire trucks took up positions as near as possible to the shore. All through the night the search for life went on. By morning it was obvious to all that everyone on board had died. The airline’s head office in Zurich issued a statement saying that there were no survivors. The plane had gone down at a steep angle so both bodies and wreckage were concentrated in a small two-hundred-foot-deep area. One of the top authorities on aviation commented after the crash that the plane could have descended from 33,000 feet when seventy miles from Halifax, and landed with minimum risk. Swissair 111’s triple-engine MD- 11, similar to the DC 10, was well below its maximum load when it left New York. Many other experts said that even if the MD-11 been only thirty miles away from Halifax and cruising at 33,000 feet it could still have landed safely. So convincing was the evidence against Swissair that the first insurance settlement of damages on behalf of one passenger was reached in the fall of 1999, long before a final decision was made on the cause of the accident. Other claims followed but three years after the crash there was little progress on the sixteen billion dollars of claims that had been assembled. All kinds of valuables came down with the plane. They included diamonds, jewels, millions of dollars in cash, and a Picasso painting worth more than a million dollars. The last-named was probably destroyed in the crash, as it had not been packaged to withstand a serious accident. The initial focus of the rescuers was on human remains and aircraft parts, not on these treasures. First priority was to discover the cause of the disaster. Later a search for the valuables was made. The U.S. salvage ship Grapple was brought in at once to help with the recovery work off Peggy’s Cove. The two black boxes, which contained flight data and cockpit conversations, were the first things to be taken from the water. The remains of only one of the 229 passengers and crew could be identified visually. The rest depended on dental and medical records and samples of DNA. The plane and its contents had been shattered because of the sharp angle of impact with the water. There were 15,000 body parts recovered and over a million pieces of the plane. One outcome of the accident was a new ruling by Swissair that the huge checklist should never be a top priority for a captain in any future similar event. The captain, said Swissair officials, must always have the freedom to use his best judgment in such circumstances. Swiss investigators finally concluded that the Swissair Flight 111 crash was caused by a fire that was thought to have started when a spark from a damaged wire ignited insulation material in the in-flight entertainment system. The final report of the Canadian Transportation Safety Board in 2003, at a cost of $30 million, the largest and most complex that the Board ever undertook, came to a similar conclusion. These entertainment systems draw large amounts of electric power.